BEIJING, Oct. 21 (Xinhua) -- The Communist Party of China (CPC) closed its 17th National Congress on Sunday, endorsing the incorporation of the scientific outlook on development into the Party Constitution and installing a new 371-member Central Committee and a 127-member Central Commission for Discipline Inspection. At the closing session presided over by Hu Jintao, 2,235 delegates and specially invited guests selected 204 members and 167 alternate members of the 17th CPC Central Committee. Zeng Qinghong, Wu Guanzheng and Luo Gan, members of the Political Bureau Standing Committee of the 16th CPC Central Committee, were not on the central committee, while Hu Jintao, Wu Bangguo, Wen Jiabao, Jia Qinglin and Li Changchun have secured seats. As is customary, the new central committee will hold its first plenary session the following day of the conclusion of the Party congress. According to the CPC Constitution, the plenum elects the central committee's general secretary, members and alternate members of its political bureau, and members of the political bureau standing committee. The general secretary shall be chosen from political bureau standing committee members. 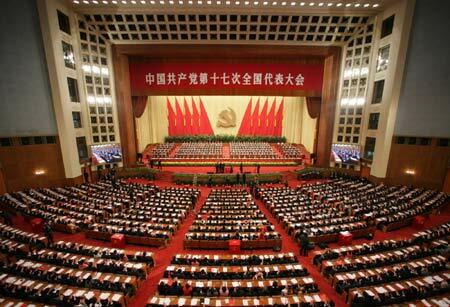 It was the fifth time that competitive election was used at the CPC congress. At least eight percent of nominees had been eliminated in the primary elections for the central committee and central discipline commission, larger than that at the 16th CPC National Congress in 2002, indicating a sign of progress of intra-Party democracy. The closing meeting also passed a resolution on an amendment to the Party Constitution, which enshrined the scientific outlook on development and unveiled the Party's determination to promote more coordinated development on the basis of social harmony, environmental protection and energy conservation in addition to economic expansion. The CPC, which was established in 1921 and took power 28 years later, has routinely amended its Constitution at past national congresses to keep up with the times. At this congress, the CPC blended its policies and principles on the work related to religious affairs into its charter for the first time, and declared it would "unswervingly encourage, support and guide the development of the non-public sector" in light of new circumstances and tasks. The amendment also involved the establishment of a sound system that could stage a comprehensive combat against corrupted officials and address both the symptoms and root causes of corruption. A tenure system for delegates to Party congresses at all levels is to be adopted while the transparency of Party affairs must be increased at all levels. The resolution said the amendment, unanimously approved at the congress, would "further strengthen Party building, constantly enhance the Party's governance capability and maintain and develop its vanguard nature". The meeting hailed the scientific outlook on development as "a continuation and development" of the important thoughts on development advanced by the three generations of the Party's central collective leadership and a concentrated expression of the Marxist world outlook and methodology with regard to development. In a speech at the closing meeting, Hu Jintao urged the delegates to bear in mind their "sacred responsibility", seriously study the Constitution and implement the theories and guidelines it upholds. The meeting also passed resolutions on the reports of the work of the 16th CPC Central Committee and the Central Commission for Discipline Inspection, fully approving the work the Party had done in past five years. "The successful practices since the reform and opening up policy was introduced 29 years ago have incontrovertibly proved that the decision to begin reform and opening up is vital to the destiny of contemporary China," said the resolution. Hu Jintao said that the Party has received congratulatory messages from political parties and organizations in many foreign countries, from the central committees of the non-Communist parties, the All-China Federation of Industry and Commerce and personages of all ethnic groups and circles in China. "We must exert ourselves to play an exemplary role in making suggestions and proposals for developing the cause of the Party and the state and rendering meritorious service, and prove ourselves worthy of the great trust other Party members have placed in us," he said. Since China has taken a less beaten track of socialism, with no precedence to follow, the congress called on the Party to continue the emancipation of mind, keep up with the times, make bold changes and innovations, stay away from rigidity or stagnation and fear no risks. "History will prove that the major policy decisions and arrangements the congress made and its important achievements are of vital strategic significance. They will play an extremely important guiding role in comprehensively advancing our the great cause of socialism with Chinese characteristics and the great new undertaking to build the Party," Hu said.